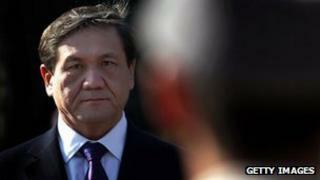 Former Mongolian President Nambar Enkhbayar has been jailed for four years after being convicted of corruption. Mr Enkhbayar was arrested in April and charged with misusing property and government power. The 54-year-old, who served as prime minister and then president until he lost office in a 2009 poll, denied the charges and called them politically motivated. He says he will appeal. The court in Ulan Batur found him guilty of taking television equipment intended as a donation to a monastery and charges relating to the illegal privatisation of a hotel and publishing house, Xinhua news agency said. It handed him a seven-year term but three years were commuted. The former leader was also ordered to compensate the monastery and had assets seized. Speaking to the BBC before parliamentary elections in June, Mr Enkhbayar said the charges were a pretext to stop him running for political office. He served as prime minister from 2000-2004 and as president from 2005-2009, before narrowly losing an election to Tsakhiagiin Elbegdorj of the Democratic Party.